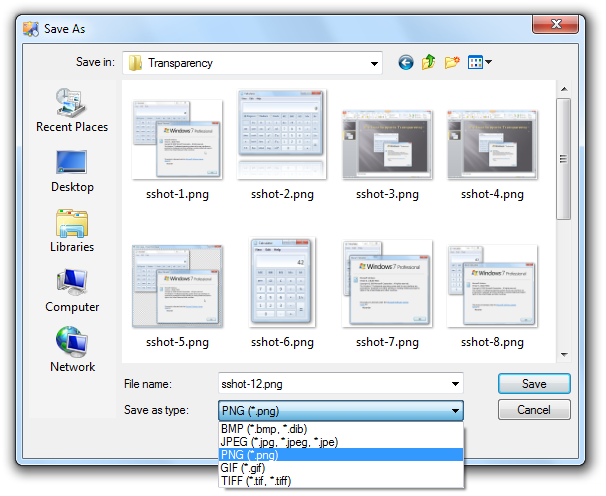 WinSnap allows you to save screenshots in several different image formats: PNG, JPEG, GIF, TIFF and, of course, BMP. There is no the “best for all” image format – each one has its own scope of possible applications. PNG (Portable Network Graphics) is a relatively new image format specially invented for the Web images. The main advantage of this picture format is its alpha-channel transparency support. The PNG is possibly the best choice for saving the screenshots as it doesn’t add distortions and noises due to its lossless data-compression algorithm. It is also the only appropriate image format for screenshots with shadows and reflections. JPG or JPEG (named after Joint Photographic Experts Group) features lossy image compression algorithm. On one hand it significantly decreases the size of the image, however the underside of such advantage are noises and distortions in the compressed image. JPG format is an excellent choice for digital photos, or high-color screenshots with a picture background, though it performs much worse with detailed images, or images that contain text. Also, JPG doesn’t support the alpha-channel so it is not suitable for screenshots with shadows or a transparency. GIF (Graphic Interchange Format) was initially developed in 1987 and was the major image format on the Web until the PNG development. The main advantage and, at the same time, the main disadvantage of the GIF is its low color depth. The Gif is capable of storing picture with 8-bit color only which ends up with 256 color in total. Too bad for most of the nowadays images. However, GIF has its pluses too. It is an ultimately light-weight format and is still applicable for the Web images. It also provides a very good compression for solid color images (like windows with large empty areas) and doesn’t add image artifacts thanks to lossless compression algorithm. TIFF (Tagged Image File Format) is a flexible image format suitable for holding a pack of images and data within a single file. TIFF uses a lossless LZW compression and thus can be edited and re-saved without losing image quality. TIFF is mostly used as a container to save scanned images and various graphics. It is also a de-facto standard for sending faxes. BMP (Bitmap) is a legacy image format with simple RLE compression algorithm or no compression at all. It stores images with any color depth from 1-bpp to 32-bpp. Due to lack of efficient compression algorithms, a BMP file is 10-15 times larger than the same image stored as PNG or JPG file. That is why BMP is not used on the Web and is only a compatibility format these days. WinSnap is capable of saving any image (except images in JPG format) in 8-bpp (bits per pixel) color depth. It utilizes the smart color reduction algorithm, so there is no huge loss in the quality of the final image. What are Suitable Image Formats to Use? In the real life, you’ll generally choose between PNG and JPG image formats to store your screenshots. Puzzled which one you need? Both PNG and JPG are suitable for Web usage, though there are several significant differences between them. 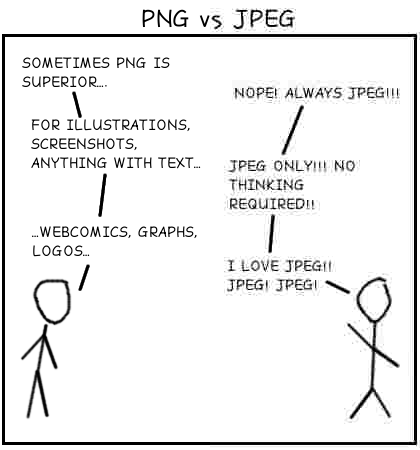 This funny picture created by Louis Brandy clearly shows the main disadvantage of JPEG. What PNG Is Good For? Pros: Supports the alpha-channel, so you can use it for images with transparent background and/or translucent shadows. It uses a lossless image compression, so you won’t see visual artifacts around a text or small details of a picture. Due to that, this format is best used with screenshots. Cons: Lossless compression isn’t very good when you need to compress a high-quality photography. A digital photo saved as PNG is 3-4 times larger (in file size) then the same image in the JPG format which doesn’t make it the right choice if you want to build a digital photo-gallery, for example. What JPG Is Good For? Pros: It features very good image compression algorithms, so it can reduce the size of an image in dozens of times in some cases! Thanks to that, a high-quality digital photo of a decent resolution takes very little bandwidth if put on the Web. This format is a perfect choice to upload your family photos to Flickr. Cons: When you save an image with lot of texts or small contrast details, you can easily notice the strange noises around them – these are the compression artifacts, and they are the price you pay for the small size of the output image file. Because of that, it is not a good idea to choose this format if you need to save screenshots of dialog windows, or screenshots with large amount of text within. In today’s world of light-speed fast Internet, PNG has become the prevailing format on the Web. Indeed, it merges a high-quality, artifacts-free compression, the alpha-channel and a quite good compressed size. That’s why this format is the default selection for saving screenshots with WinSnap.